The production of banana Cavendish AAA in Latin America and the Caribbean (LAC) constitutes a major source of income in GDP (gross domestic product) of each country. The Muse spp. AAA Group Cavendish is exposed to multiple pests and foliar diseases; whose control increases the economic value for crop maintenance. The black Sigatoka caused by the fungus Mycosphaerella fijiensis is one of the most representative conditions. In LAC the conventional method of treatment against black Sigatoka is the use of fungicides, which affect human health and the environment. For this reason, an efficient alternative to increase the resistance of the plants to the black Sigatoka, is the use of techniques of molecular biology that allows the creation of Genetically Modified Organisms (GMO). 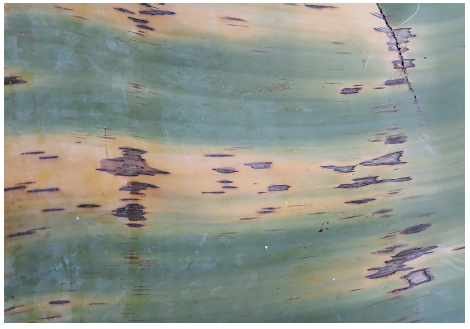 This paper reviews the identification of genes in the Musa Grain Nain and Williams to increase resistance to the fungus Mycosphaerella fijiensis. It also details the alternative techniques for modifying banana bulbs as the use of CRISPR/Cas9 for gene modification would be a powerful tool to achieve this goal because it shows successful results in the treatment of Phytoene desaturate (PDS) that causes albinism and dwarfism in plants. On the other hand, it is also analyzed the possible introduction of GMO bulbs in the main banana exporting country of the world, Ecuador, describing the possible competitive advantages that the country would obtain against the international market. Key words: Genetically Modified Organism (GMO), Musa spp. Cavendish AAA, Mycosphaerella fijiensis, pests and diseases. 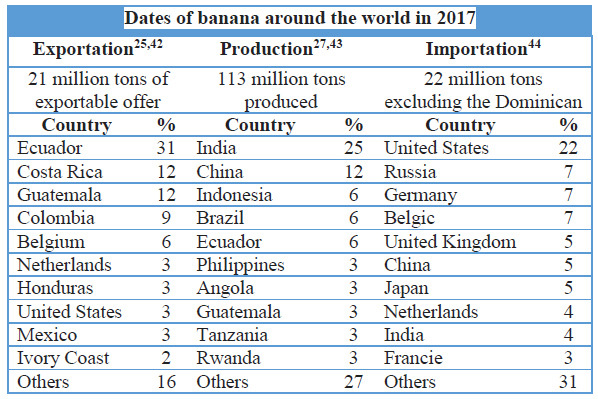 La producción de bananos Cavendish AAA en América Latina y el Caribe (ALC) es una fuente importante de ingresos en el PIB (producto interno bruto) de cada país. La musa spp. Grupo AAA Cavendish está expuesto a múltiples plagas y enfermedades foliares, cuyo control aumenta el valor económico para el mantenimiento de los cultivos. La Sigatoka negra causada por el hongo Mycosphaerella fijiensis es una de las condiciones más representativas. En ALC, el método convencional de tratamiento contra la Sigatoka negra es el uso de fungicidas, que afectan la salud humana y el medio ambiente. Por esta razón, una alternativa eficiente para aumentar la resistencia de las plantas a la Sigatoka negra es el uso de técnicas de biología molecular que permiten la creación de organismos genéticamente modificados (OGM). Este artículo revisa la identificación de genes en Musa Grain Nain y Williams para aumentar la resistencia al hongo Mycosphaerella fijiensis. También detalla técnicas alternativas para modificar los bulbos de banano, ya que el uso de CRISPR / Cas9 para la modificación genética sería una herramienta poderosa para lograr este objetivo, debido a que muestra resultados exitosos en el tratamiento del desatato de fitoeno (PDS) que causa albinismo y enanismo en las plantas Por otro lado, también se analiza la posible introducción de bulbos de OGM en el principal país exportador de banano del mundo, Ecuador, que describe las posibles ventajas competitivas que el país obtendría contra el mercado internacional. Palabras claves: Organismos Genéticamente Modificados (OGM), Musa spp. Cavendish AAA, Mycosphaerella fijiensis, pests and diseases. Bananas are one of the most important crops in the world, only in 2015 world banana exports reached 18.6 million tons1. The majority of exports from Central and South America are directed at the North American markets, Western Europe, Japan and Russia2. There are a lot of varieties of banana, however the species Banana Canvendish AAA, of the Zingiberales Order, family Musaceae and genus Musa3, It is the most commercialized and consumed tropical fruit around the world4. The annual production of Banana Cavendish globally is 50 billion tons and the largest producers are India and the Philippines, which produce around 60 tons per hectare5. There are some varieties of this banana species, but the most relevant clones are: Dwarf Cavendish, Grande Naine, Lacantan and Williams6. During the process of obtaining the banana the plant can be affected by pests, the most relevant condition is Black Sigatoka, a foliar disease of Musaceae, caused by the fungus Mycosphaerella fijiensis7. The disease reduces the photosynthetic efficiency of the plant, because the pathogen destroys the leaf area by the action of the phytotoxin, whose substance prevents the passage of electrons in the chloroplast membrane, causing foliar tissue necrosis8. The direct consequence is the reduction of the size and weight of the bunch, which represents a reduction in crop production. When the fungus is in favorable conditions and there is no chemical control of the pest, the disease can reduce the obtaining of bananas 35% to 50% in crops9. Currently the control of this pest is carried out only with the use of fungicides, which represent high costs during the production process. Therefore, the best way to reduce production costs would be the use of molecular biology techniques to generate resistance against this disease. The genes that generate resistance to black Sigatoka in the main banana varieties cultivated for export, known as ‘Grande Naine’ and ‘Williams’, belong to the monospecific triploid bananas (AAA) of the Cavendish sub-group have been identified through multiple investigations which are detailed below. Inedible cultivars, resistance to diseases is necessary to maintain the quality of the final product10. In banana Cavendish Grand Nain11 the resistance to Black Sigatoka develops through the expression of the ThEn-42 endocytinase gene, obtained from Trichoderma harzianum (fungus that is also used as a fungicide) together with the grape stilbene synthase (StSy). This gene manipulated in transgenic banana plants requires the control of the 35S promoter and the PR-10 inducible promoter, respectively. In addition, it is necessary to add the gene of superoxide dismutase Cu (antioxidant defense), Zn-SOD of tomato, under the control of the ubiquitin promoter to improve the elimination of free radicals generated during the fungal attack11,12. In banana Cavendish William it has been identified that the gene of chitinase is responsible for resistance to Mycosphaerella fijiensises13. To determine the research, it was carried out in a subtractive cDNA library after the inoculation of conidia in greenhouse conditions14. The vectors containing the promoters for the expression of the gene in banana are inserted in front of the reporter gene β-glucuronidase (uidAINT, Gus) of the plasmid Pcambia1391Z (pESKUL1 and pESKUL7)15. So for its expression, pESKUL1 contains the promoter 12-1, while pESKUL7 contains the promoter 85-116. The embryogenic cultures can be transformed through the Agrobacterium tumefaciens whose result is the production of non-chimeric stable plants. Recent research indicates that a greater combination of antifungal genes gives greater protection to black Sigatoka17. Particularly, the combination of the endocytinase gene (ThEn-42), the stilbene synthase (StSy) gene together with the Cu-Zn chloroplast and the superoxide dismutase (Cu, Zu-SOD) gene achieve this purpose. The initiation of embryogenic callus was performed with immature male flowers18 obtaining embryogenic tissue11where embryo maintenance and maturation was performed19. The regeneration of them was carried out in a basal MS medium supplemented. The regenerated mature plants were rooted in the same medium11, then hardened and transferred to the greenhouse. Plasmid YC39 containing the ThEn-42 endocytinasase gene from Trichoderma Harzianum20 was cloned between a 35S CaMV constitutive promoter, the AMV enhancer and the NOS terminator. The StSy gene was cloned under the control of the PR-10 promoter11,21. While under the control of the ubiquitin promoter, the Cu gene, Zn-SOD from tomato was cloned14. The terminators were inserted into the binary vector pGA 42911. Genomic DNA was isolated from the leaves of banana plants grown in vitro11. A Southern blot analysis was performed to confirm the stable integration of the transgenes. The DNA fragments containing the nptII gene were amplified from the plasmid with the same sets of primers used for the PCR analysis, and used as a hybridization probe in the Southern blot membrane. Endocytinase activity was measured in leaf samples of transformed and wild-type plantain plants using the fluorescence bioassay of umbelliferil20. The Clustered Regularly Interspaced Short Palindromic Repeats (CRISPR) / Cas9 (CRISPR-associated protein9) genome editing technology has shown great promise for quickly addressing emerging challenges in agriculture22. Currently, CRISPR / Cas9 is used only to improve the characteristics of bananas, with the aim of increasing product quality in the market. However, CRISPR / Cas9 could be applied to enhance the mechanisms of resistance to foliar diseases of this important tropical crop23. For example, recent research has used the CRISPR / Cas9 gene editing system to deliver a self-resolving polycistronic guide RNA (GRNA) designed to target the gene for the enzyme phytoene desaturase (PDS), key in the carotenogenic pathway. PDS causes albinism and dwarfism by altering the biosynthesis of chlorophyll, carotenoids and gibberellins, in the Cavendish cultivar "Williams". In this way it is verified that the CRISPR / Cas9 is a tool that will allow the development of resistance to diseases24. Latin America and the Caribbean (LAC) is the largest banana export region, accounting for 66% of Cavendish's world exports25. There are seven banana species that are produced in LAC, of ​​which 3 are Cavendish26. Therefore, the volume of production in LAC of the Cavendish type is 20 million tons27. The average price of the Cavendish banana has a progressive increase28 due to the demand in the international markets. In the Caribbean, prices have increased considerably above the regional average, reaching more than US $ 1,000 per ton in Jamaica. However, countries like Peru show a value of US $100 per ton28. An influence for the price difference are the conditions of the banana as quality, size, etc. which underlie the development of the plants and therefore their exposure to pests. Table 1. Dates of exportation, production and importation of Musa spp. around the world. For this reason, important research centers such as the Honduran Foundation for Agricultural Research (FHIA) in Costa Rica and Empresa Brasileira de Pesquisa Agropecuaria (EMBRAPA) in Brazil develop improved hybrids (FHIA-21, BLS-resistant plantain-like hybrid) with success29,30 in resistance to black sigakota. In order to reduce the use of fertilizers which generate high maintenance costs, and affect the properties of the soil. However, the large-scale adoption of these hybrids is not always guaranteed due to differences in taste and processing qualities (e.g. see31). The use of resistant GMOs is recognized as one of the solutions to reinforce the potential of genomic studies of bananas and pathogens32. Although in LAC, it has not worked in particular, certain clones from the Philippines, Java, Malaysia, Bali, Papua, New Guinea and Solomon Islands with a genetic improvement program34. For example, genetic engineering in Uganda develops cultivars resistant to local pests and diseases, with improved agronomic attributes that are acceptable to consumers33,36. This is a possible solution to the problem of paying more than US $ 200 per hectare per year in the maintenance of the crop. Uganda could generate potential annual benefits ranging from approximately US $ 179 million to US $ 365 million35. For this reason, the banana improvement program pursues a holistic approach, which combines cultivars for diseases and integrated pest management (IPM) 34. This includes clean propagules, biological control and better crop management techniques for successful production35. In Ecuador there are approximately 166,972 hectares of bananas, located in the Littoral region, particularly in the provinces of Los Ríos, Guayas and El Oro37. The loss of banana production is 50% due to pests and foliar diseases, the most representative of which is Black Sigatoka38. In Ecuador, Black Sigatoka is controlled by aerial spraying39; however, climate variability has caused the disease to behave differently at the national level37. As a consequence, the most affected province is Los Ríos, with losses of up to 74% of production37. In this province, between 25 and 29 cycles of fumigation per hectare of plantation are applied annually; whose approximate cost is five hundred dollars per cycle40. In the control of the black Sigatoka, systemic fungicides such as strobilurins and triazoles are used that keep the pathogen sensitive39. However, the consequences of its use harm both human health, because they generate respiratory, endocrine, skin problems, etc., as well as the environment40. Fig. 1 Close-up of a wild type leaf of the musa spp. Cavendish AAA. Note the necrotic regions surrounded by the yellowing of the leaves, the signs of Black Sigatoka damage. Exemplary located in the San Marcos farm at 1km from the Mocache, Province of Los Ríos, Ecuador. An alternative mechanism to control Black Sigatoka is the use of GMO37. However, article 401 of the Political Constitution of the Republic of Ecuador declares the country free of bulbs and transgenic crops, which would mean that GMOs are not circulating in Ecuador at present, and any exception to this article must be justified by the Presidency of the Republic of Ecuador41. Therefore, the application of techniques that genetically modify the banana plant are restricted. Improving the production of the Cavendish AAA banana by conventional methods is difficult, due to the high sterility of the female gametes, the polyploidy that exists in most varieties, and the long periods of the growth cycle40. The production in Ecuador of a genetically modified Cavendish banana with resistance to Black Sigatoka, is the best alternative to avoid production losses37 and the use of fungicides40 that harm human health and the environment. Therefore, it is expected in the future, greater openness on the part of the Ecuadorian legislative bodies to establish regulatory frameworks, allowing the research and use of genetic engineering technology as a practical alternative for the improvement of crops in Ecuador. The Cavendish banana is a product of relative importance in the economy of the LAC countries. Current methods of protection against black Sigatoka are functional but not efficient. For this reason, the use of molecular biology tools for the edition of genes resistant to pathogens would radically decrease the use of fungicides. In this way, the high costs of maintaining banana crops would be reduced, as well as contributing to the ecology. The application of GMOs in African countries has shown comparative competitive advantages with the hybrid bulbs used in LAC. Cultures of Musa spp. AAA Cavendish cv. Grand Nain and Williams contain manipulable genes that through efficient methods increases the resistance to the fungus Mycosphaerella fijiensis. One of the most efficient techniques to generate resistance to black Sigatoka is the use of agrobacterium tumefaciens as a conventional method of genetic transformation. In particular, the use of recent innovative techniques such as CRISPR / Cas9 for gene modification would be a powerful tool to generate high resistance to diseases caused by fungi, maintaining banana quality and decreasing the high maintenance costs of LAC crops. In Ecuador monocultures predominate, especially banana; the area of greatest production is the littoral region, which is affected by foliar diseases, especially Black Sigatoka. To control this pest requires the indiscriminate use of agrotoxins, which decrease the fertility of the soil and harm human health. If the Ecuadorian territory is promoted the research and development of technologies to genetically modify the Musa spp. AAA Cavendish, the high maintenance costs of these crops would be reduced, potentially increasing the competitive advantage of Ecuador in the international market. 3. Soto B. Banano cultivo y comercialización. San José, Costa Rica: Litografia e Impressa LIL. 1985; 648. 5. Prabha T, Bhagyalakshmi N. Carbohydrate metabolism in ripening banana fruit. Phytochemistry. 1998; 48: 915 - 919. 6. Mohan Jain, S., Priyadarshan, P. M. Breeding Plantation Tree Crops: Tropical Species. Springer Science+Business Media, LLC, 2009. ISBN 978-0-387-71199-7. 9. Riveros AS. Estudio del potencial antifúngico y de inducción de resistencia de extractos de origen vegetal para el control de la Sigatoka negra en plátano. In: Proc Primer Encuentro de Investigadores en Agricultura Orgánica, held at the Programa de Investigación y Transferencia de Tecnología Agrícola (PITTA), Guácimo, Costa Rica, 9 to 10 Nov. 2000;25–26. 13. Gutiérrez-Román, M. I., Holguín-Meléndez, F., Dunn, M. F., Guillén-Navarro, K. & Huerta-Palacios, G. Antifungal activity of Serratia marcescens CFFSUR-B2 purified chitinolytic enzymes and prodigiosin against Mycosphaerella fijiensis, causal agent of black Sigatoka in banana (Musa spp.). BioControl. 2015;60: 565–572. 16. Santos Ordóñez, E.G. Characterization and isolation of T-DNA tagged banana promoters active during in vitro regeneration and low temperature stress. Dissertationes de agricultura. Ph.D. thesis. Katholieke Universiteit Leuven, Faculteit Bio-Ingenieurswetenschappen, Leuven. 2008;787. 17. Jach G, Gornhardt B, Mundy J, Logemann J, Pinsdorf E, Leah R, Schell J, Maas C.. Enhanced quantitative resistance against fungal disease by combinatorial expression of different barley antifungal proteins in transgenic tobacco. Plant J. 1995;8:97–109. 21. Wiese W, Vornam B, Krause E, Kindl H. Structural organization and differential expression of three stilbene synthase genes located on a 13 kb grapevine DNA fragment. Plant Mol Biol. 1994;26:667–677. 22. Bortesi L, Fischer R. The CRISPR/Cas9 system for plant genome editing and beyond. Biotechnol Adv. 2015;33:41–52. doi: 10.1016/j.biotechadv.2014.12.006. 25. Dita, M. A., Garming, H., Bergh Van den, I., Staver, C. and Lescot, T. Banana in Latin America and the Caribbean: Current state, challenges and perspectives. In: Van den Bergh, I., Edson, A. and Vincent, J. (Eds), Proc. Int. ISHS ProMusa Symp. on Bananas and Plantains: Towards Sustainable Global Production and Improved Uses. Acta Hort. 986, ISHS 2013. 2013;365–80. 31. Dadzie, B. K. and Orjeda, G. Post-harvest Characteristics of Black Sigatoka Resistant Banana, Cooking Banana and Plantain Hybrids. Inibap Technical Guidelines 4. 1998;1-74. 33. Kikulwe, E. M., Nowakunda, K., Byabachwezi, M. S. R., Nkuba, J. M., Namaganda, J., Talengera, D., … Tushemereirwe, W. K. Development and dissemination of improved Banana cultivars and management practices in Uganda and Tanzania. Research Report of the International Food Policy Research Institute. 2007;155. 35. Kikulwe, E. M. On the Introduction of Genetically Modified Bananas in Uganda: Social Benefits, Costs and Consumer Preferences. PhD thesis, Wageningen Univ. 2010. 36. Jaffe, G. Comparative Analysis of the National Biosafety Regulatory Systems in East Africa. EPTD Discussion Paper 146, International Food Policy Research Institute, Washington, D.C. 2006. 37. Ministerio de Agricultura y Ganadería. Boletín Situacional del Banano. 2017. Retrieved from http://sipa.agricultura.gob.ec/index.php/bananos/boletines-situacionales-banano-ecuador . 39. COMTEC. Alerta en el empleo de benzimidazoles para el control de Sigatoka negra en Ecuador. Paper read at “Comité técnico para el manejo adecuado de fungicidas para el control de Sigatoka negra en banano y plátano. Julio de 1999. At Guayaquil, Ecuador. 40. Martillo E., Solano P. Situación de la Sigatoka negra en el Ecuador. In: Rivas G, Rosales F, editors. Manejo convencional y alternativo de la Sigatoka negra, nematodos y otras plagas asociadas al cultivo de Musáceas de los trópicos. MUSALAC. 2003;13-18. 41. Congreso Nacional. “Constitución del Ecuador”. 2008. Retrieved from www.asambleanacional.gov.ec/documentos/constitucion−de−bolsillo, Asamblea Constituyente: Quito, Date of Consultation: November 20, 2018.